Get a Lifestyle - At last, Life is about you. The lowcountry is full of wonderful neighborhoods that boast of convenient living and an ideal climate, but very few places can offer what�s available at Del Webb at Cane Bay. Del Webb communities are known for quality homes and resort-style amenities, but they offer something more. 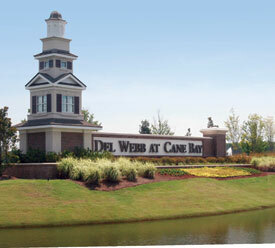 Money can�t really buy the most intangible asset at Del Webb at Cane Bay. 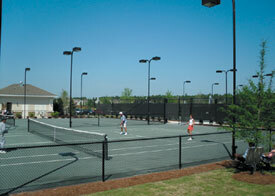 It goes far beyond quality home construction and resort-style amenities and beautifully landscaped grounds. That asset is lifestyle, a word often bandied about but perhaps not fully understood. It is more than just golf and tennis. People who move to Del Webb at Cane Bay discover something they have been searching for all their lives: the opportunity to do as much or as little as they wish and the chance to rediscover childhood hobbies or to excel at games � or even to pursue education. Lifestyle director Jennifer Burton said she finds it interesting to work with residents because they are so involved in creating this lifestyle. Stella Sullivan and Mike Hand had some pretty deep roots in Massachusetts. They lived in Lexington and vacationed often at Cape Cod. In 2002, it seemed only natural to retire there. During the brutal Northeastern winters, Sullivan and Hand spent time in Florida. Life was good. So what possessed these two to settle in Cane Bay, near Summerville, South Carolina? It was a combination of the Northeastern climate and the seemingly endless drive to the Sunshine State and back. They checked out numerous retirement communities in Florida and stayed at a few places, but nothing seemed quite right. Then, on the way home, an e-mail about Del Webb at Cane Bay changed everything. Sullivan and Hand loved the climate and were hooked by the location in Berkeley County, near Summerville, Moncks Corner and historic Charleston. �I checked everything, including the distance to Publix and to the beaches and everywhere else,� she said. 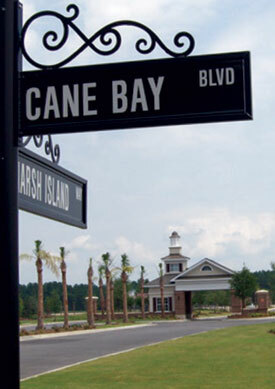 The couple has seen Cane Bay grow dramatically, literally from nothing to 270 homes. Upon completion, the Del Webb community will include about 1,000 homes. Kathy and Fred Bentley are big fans of the Del Webb lifestyle. In fact, after years of working for the National Park Service, their plan all along was to settle in a Del Webb community in a congenial climate. Kathy Bentley confided that she and her husband first moved to Sun City Carolina Lakes, just south of Charlotte, North Carolina, explaining that the number one reason for moving South was retirement. Two years ago, the Bentleys saw an ad for Del Webb Cane Bay near Charleston and decided to make one more move. �We love all the things this area offers and the wonderful weather,� Bentley said. 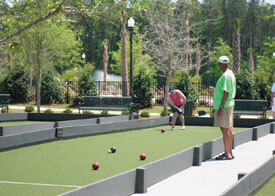 The Bentleys settled into their new home in Cane Bay in May and have enjoyed exploring the area. They�ve been on a carriage ride in downtown Charleston and visited the beach. �We had an evening downtown and took the ghost walk,� Bentley said, adding that she looks forward to many more excursions and to getting involved with cultural events in the community. �I love where I live!� she exclaimed. Not that there is much reason to leave Cane Bay, with the scores of activities offered by Del Webb communities, one of the big draws for the Bentleys. It�s all about lifestyle for Al and Sue Liegl. Formerly of Cleveland, the Liegls enjoy socializing with friends, and Del Webb at Cane Bay affords them the opportunity to do just that. In fact, within days of closing on their home in October 2008, the Liegls were invited to a party. The Liegls chose Charleston to be near their son and daughter-in-law, who both are stationed at Charleston Air Force Base. Liegl said there are people from almost every state at Cane Bay, which adds to the fun. He explained that just about any activity or interest is represented and that �if there�s not a club, make one.� But, he said, it is all up to the residents to do as much or as little as they like. The Liegls are both involved in the community � Sue helps with social events and Al is involved with maintenance and safety. They are also ambassadors for Del Webb at Cane Bay. For a good time at Cane Bay, drop by �The Garage,� an impromptu neighborhood social gathering at the home of Allan Beavers and Bonnie Craven � if they�re at home, that is. Beavers and Craven were childhood sweethearts in Omaha, Nebraska. Bonnie eventually moved away, and they lost touch with each other. Fate intervened and brought the two sweethearts back together after both were widowed. Beavers owned a home in Omaha, where he still has family, and Craven had a house in Charleston. To make traveling back and forth easier, the couple purchased a motor home. Then they decided to simplify. An acquaintance suggested that they look at Cane Bay. They rolled back into town in time to close and move in, aided by some of their children and grandsons. Because they wanted to enjoy traveling in the motor home � they�re gone about five months out of the year � it was important to have a home base in a secure, gated community where �guards keep an eye out.� Craven�s police officer son adds a degree of safety by living there temporarily and has hinted that they �might have a hard time getting rid� of him. �We love it,� Craven says. For many, retirement conjures up a fantasy of carefree living, fun with friends and enjoying the adventures of each new day. At Del Webb at Cane Bay, it�s no fantasy. It�s the real thing.